Heroku Cloud Guide to Create An Easily Customizable Archive For Your Tweets. It is a step by step guide that will enable any level of use to work and build. Again, this is the biggest Cloud Computing tutorial proving non product selling website on this Earth. If you get stuck on any step, simply use the search box on this website like searching on Google Web Search. You might found another Heroku Cloud Guide or any theoretical article to clean your concept (or your anger from failure). The first thing is that, you need to realize the fact that Heroku Cloud is basically free and the best way to use Heroku Cloud is to create a hosted Facebook App (because you will get SSL for free too) in the way we demonstrated with WordPress installation before ! So practically you can use a Facebook Tab named Tweets on your official FaceBook page. SSL increases reliability plus the domain name is of Facebook ! In other words, if you understand that WordPress guide linked above, just replace WordPress with this excellent App. The last thing you might be thinking – if you need non Facebook domain, what should be done to get own domain. That custom domain name part id described here. In other words, if you click (at that time) that Updates link. 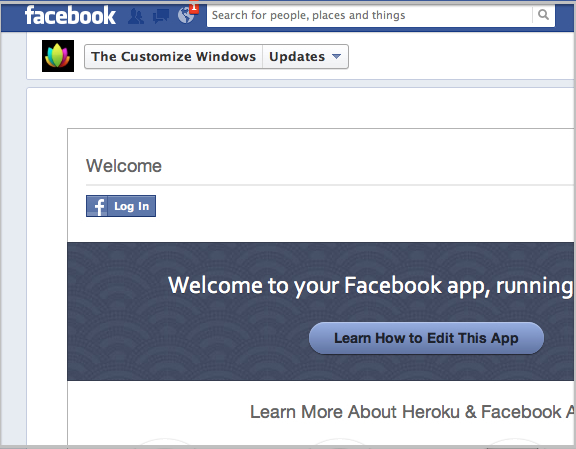 The default webpage of Facebook PHP App hosted on Heroku will appear. 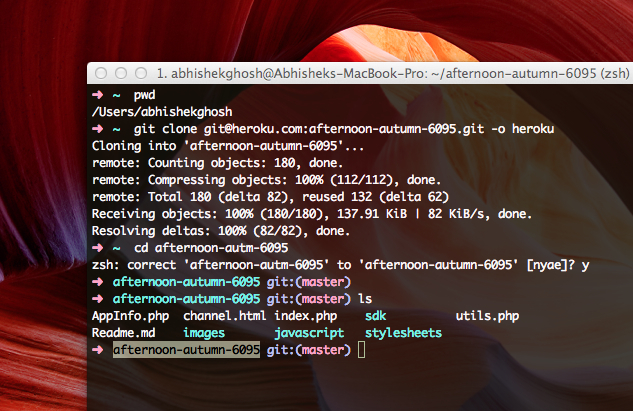 Now basically all works are fully related to Heroku Toolbelt, Command Line and Git. We are showing from Mac, there will be no practical difference between Mac, Windows and Linux if you follow that previous linked WordPress guide. We will clone this crap default App. Delete everything, Clone that Repo from GitHub and deploy it. As simple as 1-2-3. Only catch of this guide is – Heroku has postgresql as free database, not MySQL. There are various ways to get an edge above this limitation – either using a paid option on Heroku, using a Cloud Database you already is using – link Rackspace Cloud Database for our case, also this was demonstrated before. If you do not have Rackspace Cloud account, you practically need not to think – do a bit search, there are lot of big vendors are waiting with a free tier of usage to promote their Cloud Database as a Service. In our case, the app’s original name is afternoon-autumn-6095 and url is https://afternoon-autumn-6095.herokuapp.com. Please copy-paste the commands respecting this name – use your own app name and url, otherwise obviously nothing can be done. It is better to use a proper web folder, Heroku Cloud by default lack it. 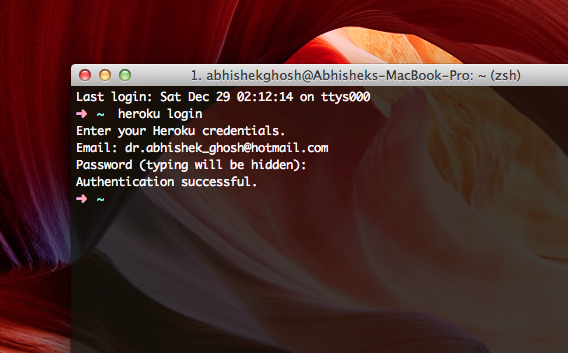 We have shown how to get a real webroot in Heroku before. You need to have cURL enabled (or PHP 5.1 with the PECL JSON module installed in addition). And push and deploy to Heroku Cloud. That is basically the same like the previous WordPress Guide. The difference is – you will not create a postgresql database, you will add an MySQL database of your choice and push it. This Article Has Been Shared 1643 Times! 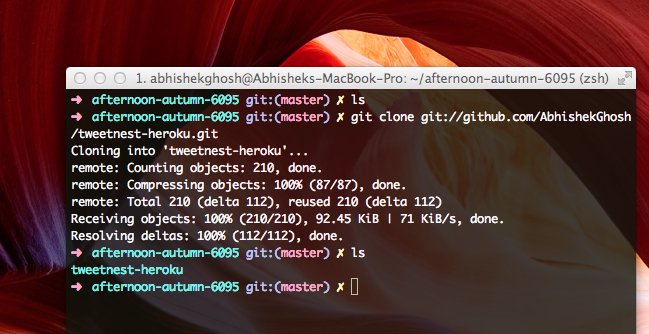 Cite this article as: Abhishek Ghosh, "Heroku Cloud Guide : Create An Easily Customizable Archive For Your Tweets," in The Customize Windows, December 28, 2012, April 25, 2019, https://thecustomizewindows.com/2012/12/heroku-cloud-guide-create-an-easily-customizable-archive-for-your-tweets/.